This afternoon we were waiting for two little girls to come over with their parents. 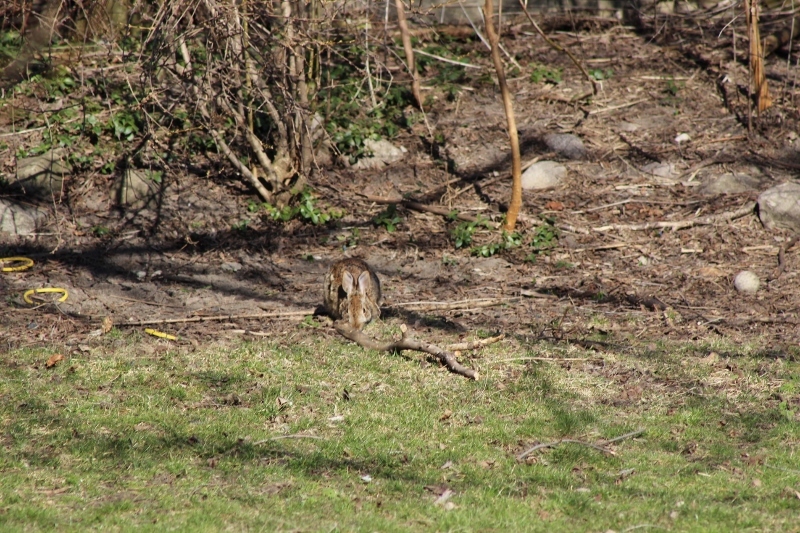 The Easter Bunny had 'hidden' goodies in our backyard for them to find. 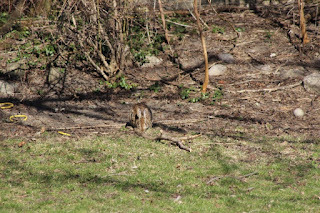 While looking out to make sure that the squirrels didn't eat the little girls' goodies, a brownish hare was spotted in the very back of the yard. He/she was camouflaged very nicely. 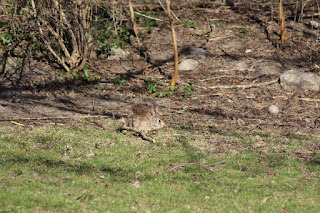 The bunny stayed the whole afternoon and I cut up a carrot for it. 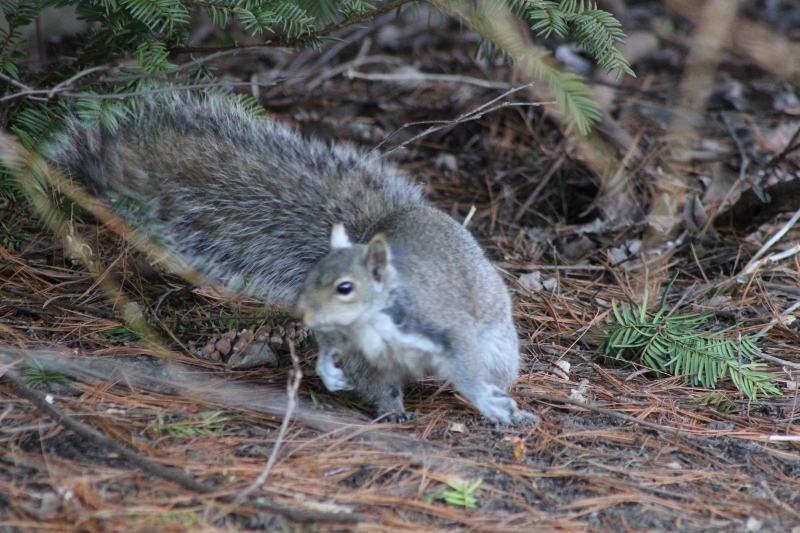 We live in the city where the main wildlife we see are squirrels, birds and raccoons. 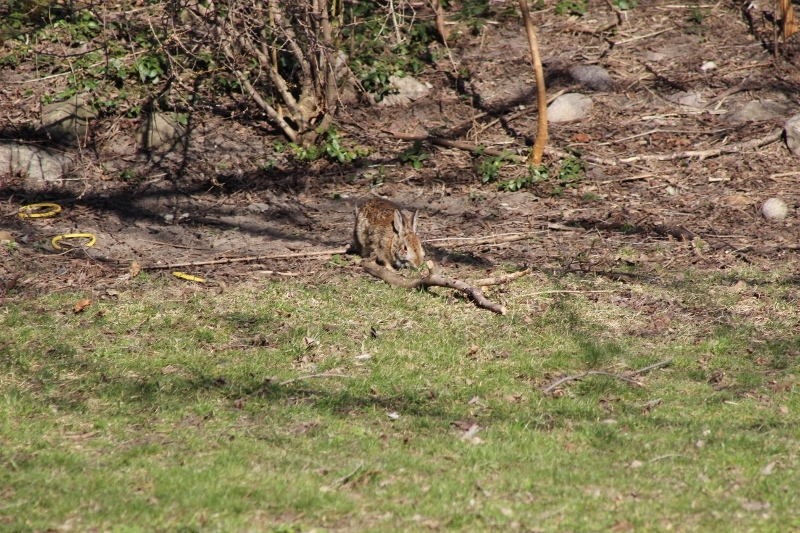 To see a bunny is rare but to have one show up in our backyard on Easter Sunday is truly magical. 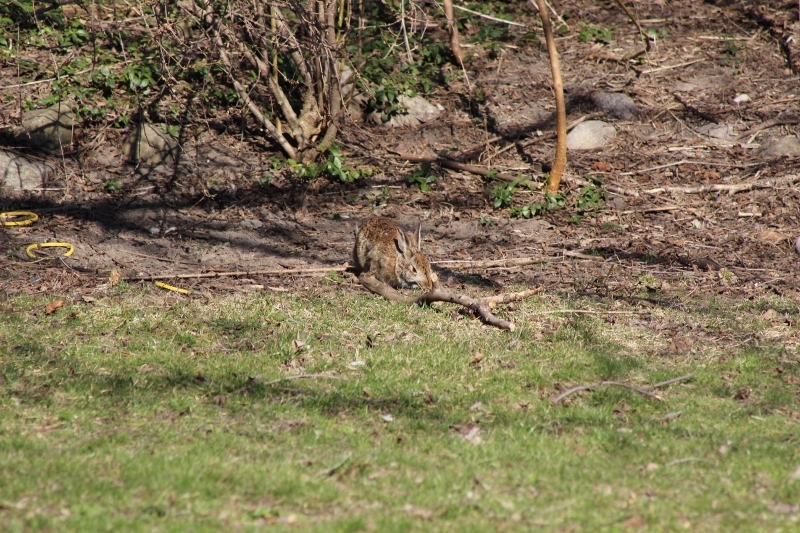 I'm surprised that this little guy was spotted since he really is very well camouflaged. The photos were taken by my son, Eric. All of these photos can be made bigger by just clicking on them. I wonder if he'll come back. One of the little squirrels that hang around. My husband feeds them peanuts in the shell. 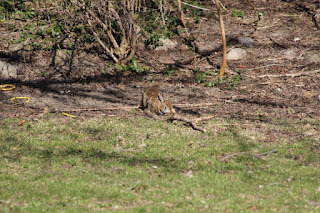 The little bunny was quite fast and ran to our neighbour's backyard whenever he was startled. I hope you all had a safe and very Happy Easter! Loved your pictures! I hope the two little girls got to see the Easter bunny! Very special! Happy Easter. 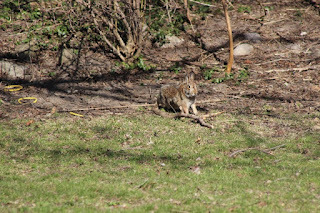 What a funny thing to happen, a sweet bunny on Easter. Lucky you had carrots. I've never seen a black squirrel but the grey ones are everywhere here. They drive my cat nuts and eat the bird food. The children must have loved the wild life. What a wonderful thing to happen for Easter. We live in the centre of Saskatoon and we have been feeding the rabbits all winter. They are so interesting. The squabble and punch at each other, wash themselves like cats and one night last week one lay down on the snow in the middle of the road and rolled like a dog . They have been so entertaining. 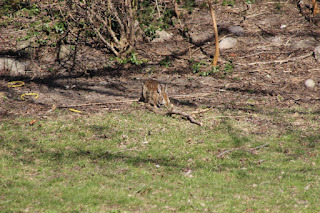 We have had bunnies here at our house in the city, they like to hide under our evergreens, but sadly we also have hawks and falcons and I haven't seen any bunnies in awhile. How fun to see one Easter morning like that! 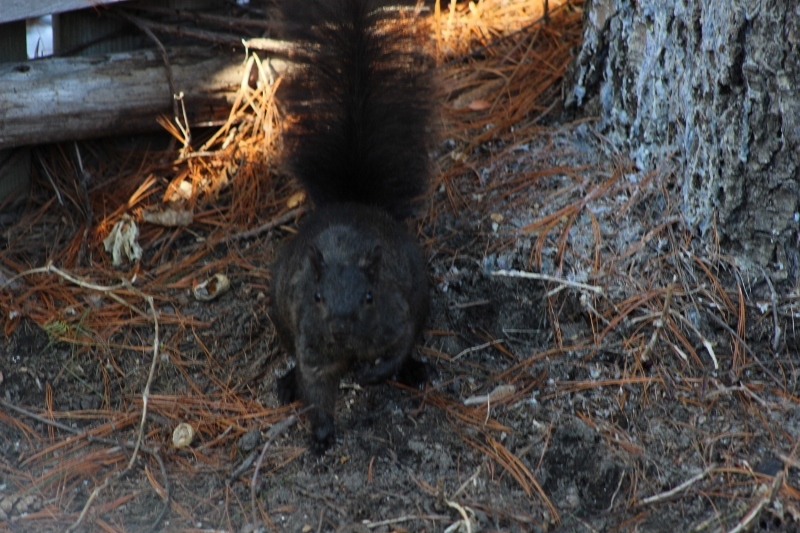 We have black squirrels here too - only used to see them up north, but they've moved down here now. My brother has a couple of "pet" squirrels who sit on the peak of the roof of his garage and wait for him, as soon as he gets home from work he has to feed them, lol....peanuts in the shell. They eat out of his hand now, and scold him if he's late! 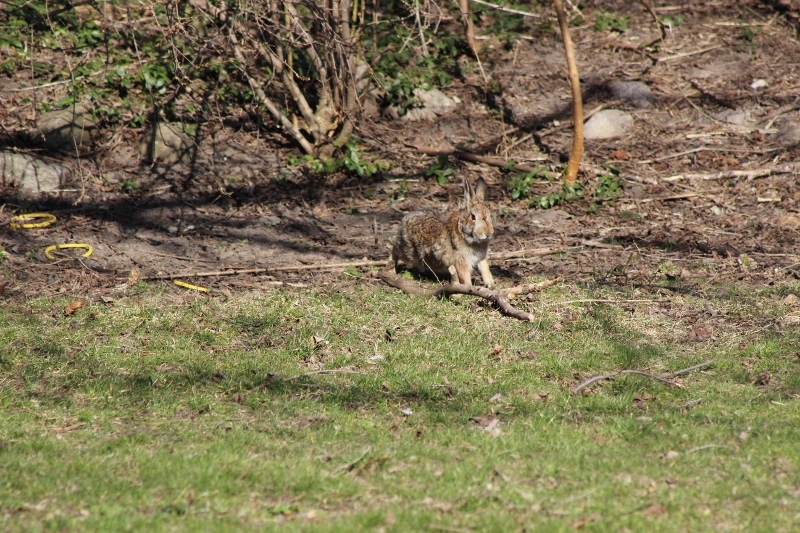 How special to have a real bunny visit, especially at Easter. I hope the little ones were able to see it.